What type of organization is FastTrek? FastTrek.org is non-profit corporation incorporated in the state of Rhode Island, and is currently pending 501(c)3 status. It is located and operating in The Social Enterprise Greenhouse (an incubator for innovators and startups), at 10 Davol Square in Providence, RI. FastTrek.org is available to everyone. Patients, patient-advocates, caregivers, friends & family are all welcome to create an account. Does FastTrek.org charge for the services they provide? All resources, services, and information provided by FastTrek.org comes at zero cost (FREE) for all users. 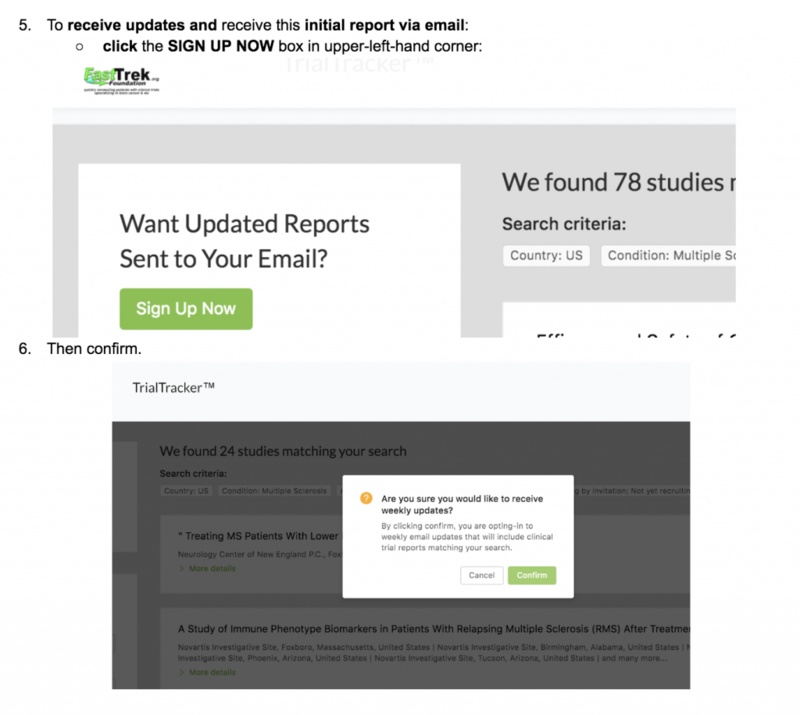 We do, however ,request that you create a free, anonymous account to access the personalized reports and FastTrek TrialTracker. Will my identity stayed protected if I create an account? Please feel free to use any alias you like. Does FastTrek.org provide medical advice? No, all the information provided by FastTrek.org should be shared in a consultation with a doctor or specialist. FastTrek.org does not provide any medical advice or care. It simply provides a user with all their options. 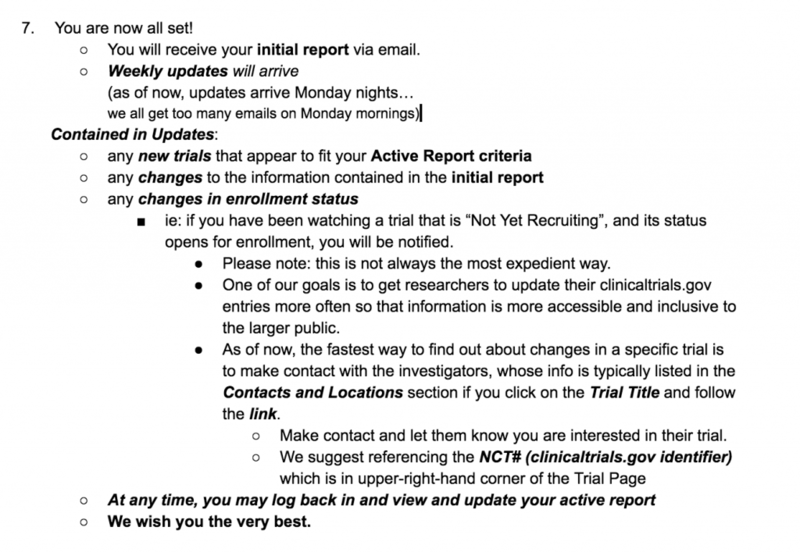 How are the clinical trials sourced? 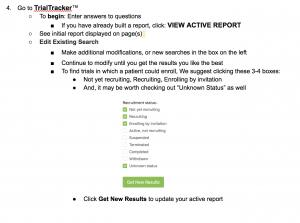 I need additional assistance using the FastTrek TrialTracker™, who do I contact? 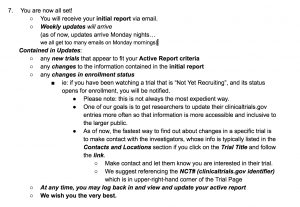 Why should I consider clinical trials? Now, imagine the medical advancements that could be made with the synthesis of that technology and that advancement of understanding of what makes up the body. The medicine that is coming out these days is the synthesis of these advancements. We are on the cusp of many medical breakthroughs. Doesn’t this seem backwards? You are giving me information to bring to my doctor or specialist? Explain. Due to the rapid advancement of medicine— among other reasons– the only trials specialists typically bring up are the one(s) available at their particular hospital (and most hospitals don’t have too many). It makes sense. You don’t expect the chef at your favorite Italian restaurant to know the menu at your favorite Mexican place down the street. One needs to go there to get the menu. It is the same way with hospitals and clinical trials. Doing the legwork for the doctor makes the doctor’s job easier. Bring them a report and allow them to review it with the patient. They may find that some of the options would be good a good fit. Are you guys in the pocket of big pharma? FastTrek was created by a patient, a caregiver and a recent college graduate with a degree in international health promotion and an acceptance into the peace corps. We created this with the intent to help others receive the best care possible. We believe in the power of clinical trials; we have not been paid to have this view. Where does my money go when i donate? Our services are 100% free. We run a lean organization, but a few of us are needed to make it work. Here is a link to our budget. We also dedicate a piece of our budget to advertising. We micro-target folks searching for information about the diseases we currently cover and their respective treatments. When people are thrust into this world, it can be overwhelming. Our goal is to make obtaining the best treatment as easy as possible, and to use modern technology to achieve our goals. 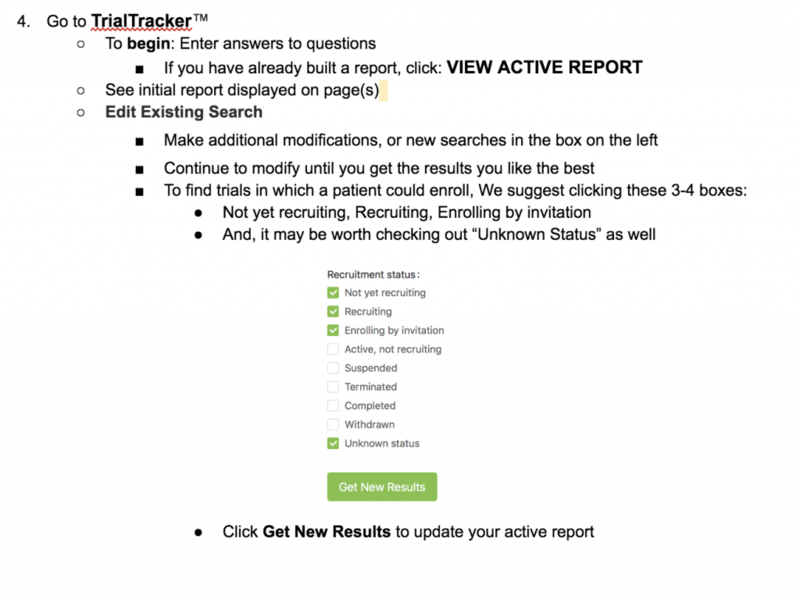 How do I sign up for FastTrek TrialTracker™? FastTrek.org is a charitable organization with an IRS 501C3-pending status | Copyright 2017 FastTrek™ & Fasttrek.org | All Rights Reserved | This is not medical advice.